At 9:20 a.m. on the morning of November 7, 1943, Lieutenant George F. Connolly was returning to the Charlestown Naval Auxiliary Air Field in an SBD-5 Dauntless aircraft, (Bu. No. 28818), after a dive-bombing training flight. He lowered the landing gear and made his approach, but upon touchdown with the runway, the right side landing gear collapsed causing the plane to be thrown sharply to one side, which tore away the left side landing gear before the plane skidded to a stop. 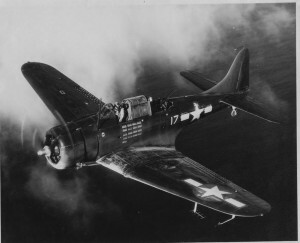 The aircraft was damaged beyond repair, but Lt. Connolly and the gunner, ARM3c J. C. Burkhart, were not injured. Both men were assigned to VC-52. The cause of the accident was found to be metal fatigue of the landing gear strut.